Since creating the Bicycle Friendly State Program in 2008, the League of American Bicyclists has ranked each state based on the actions taken to make bicycling better. Of special focus has been outcomes and activities by state legislatures and their departments of transportation. For 2018, the League used federal data on bicycling to highlight the evolution of biking-related inputs and outcomes in every state during the last decade. The Progress Reports provide graphs of state ridership, safety and spending, including comparisons to regional and national averages for each indicator. 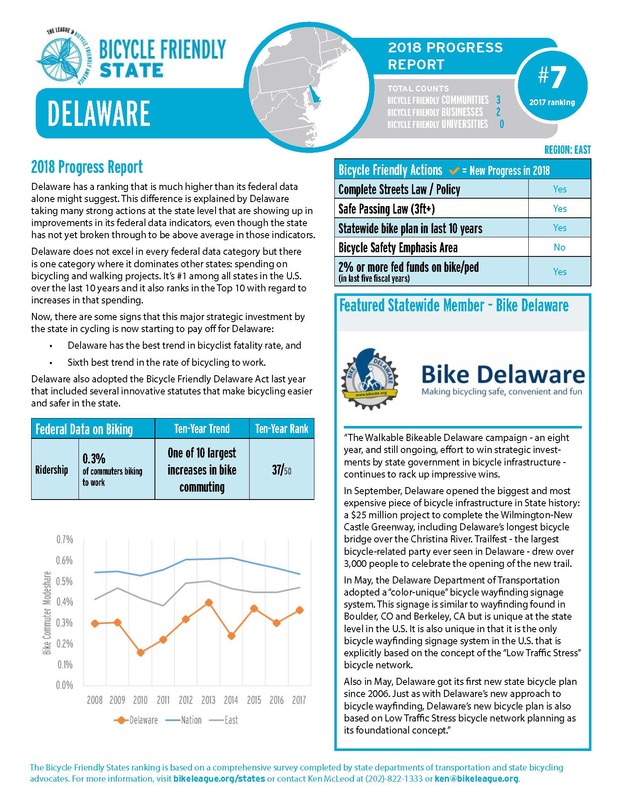 You can find your state progress report here: https://bikeleague.org/content/progress-reports. Each Progress Report provides a wealth of information on bicycling in each state pulled from federal data sources. » Ridership – this data is based upon the annual American Community Survey (ACS), which provides data on bicycle commuting. » Safety – this data is based upon two sources, traffic fatality data from the National Highway Traffic Safety Administration (NHTSA) and the ACS. »We use a measure that approximates the number of bicyclists who were killed in traffic per 10,000 bicycle commuters. While less than half of the states have an estimated 10,000 bicycle commuters, this measure allows comparisons between states in a way that accounts for the prevalence of biking. » Spending – this data is based upon data reported to the Federal Highway Administration by state Departments of Transportation and other agencies that obligate federal transportation funding. » Information about the state Department of Transportation’s efforts related to bicycling. Based upon a decade of data, it appears that more states are beginning to find their role in promoting and protecting people who bike, but bicyclists still face difficult and dangerous roads in many places. » Since 2008, the number of states with a Complete Streets action – whether a resolution, policy, or law – has more than doubled. Now, at least 34 states have taken at least some Complete Streets action, an increase from 14 in 2008. » Since 2008, the number of states with a safe passing law has more than doubled from 15 to 35. » Since 2008, the number of states who have ever adopted a Bike Plan has increased more than 60%, from 23 to 38. Unfortunately, only 25 states have a Bike Plan that has been adopted in the last decade. » Since 2008, the number of states spending at least 2% of federal transportation funds on biking and walking has increased more than 40% to 23 states in fiscal year 2017. The Bicycle Friendly Actions that we highlight are not perfect measures for a state’s commitment to improving bicycling. As binary indicators, they do not recognize or parse the vast differences in quality and implementation that lay behind each action. However, data shows that there is an association between actions and outcomes. Despite this progress, there are some troubling trends in federal data. Bicyclist safety is trending in the wrong direction in most states with a higher rate of bicyclist fatalities per 10,000 bicycle commuters in 38 states. This is also seen nationwide, where 2016 had the highest number of bicyclist fatalities in 25 years. While it is possible that there are increases in the amount of bicycling that are not captured by commuting statistics or other national data sources that explain the higher rate and number of bicyclist fatalities, these trends are troubling in an era where states are – on paper – committed to zero traffic deaths. Rates of bicycle commuting are also an area of some concern. Most states hit a high point in either 2013 or 2014 and have seen modest decreases since then. Unfortunately, this is most seen in the states with the highest rates of biking to work – highlighting the need for continued action in states with relatively high rates of biking to work. On the plus side, states with low rates of biking to work have mostly seen improvements over the last decade. States with low rates of biking to work are highly concentrated in the South with 9 of the 10 lowest rates of biking to work belonging to Southern states. The League launched its Bicycle Friendly State program in 2008 in order to better understand state efforts related to bicycling and provide a comparative framework that allows states to easily identify areas of improvement. Through our ranking, we hope that states and the public can easily understand the relative strengths and weaknesses of each state’s efforts related to bicycling. To learn more about the data on each Bicycle Friendly State Report Card, please reference this Guide that describes the data sources, calculations, and surveys used to create the report cards and rankings. More information about the Bicycle Friendly State program, including past report cards, rankings, and maps can be found here: https://bikeleague.org/states.